These items are the perfect choice for creating safe storage space on a budget. They are carefully constructed from hardy steel and offer great protection for your items. They even have an anti-bacterial coating, which keeps your items cleaner and saves you the trouble of sanitizing them as often. These products are perfect for storing and protecting personal items, uniforms, wallets, gym clothes and anything else that needs protection. 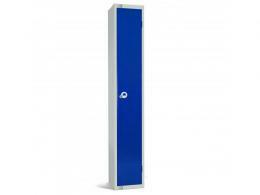 Economy lockers are perfect for use in a variety of spaces—such as schools, offices, gyms and community centers. They are easy to install and use, so they can be placed anywhere with minimum effort. They are an especially good choice for more humid areas like gym showers, which are prone to higher rates of bacterial growth. The anti-bacterial coating stops harmful bacteria buildup before it begins. These products are great for anyone who needs to store personal items in a safe and budget friendly manner. They can be used by students who need to store books and personal items in-between classes. They can also be used by factory workers, gym members, and even in an office setting to store personal items. These products come with a standard 1 year parts and labor warranty. They feature standard mastered cam locks to keep your personal items safe and protected. 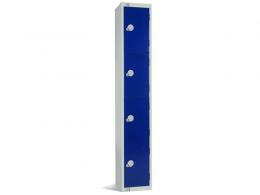 The anti-bacterial powder coating protects against bacterial and fungal growth. You can buy a locker with one door to six doors, depending on how much space you need. You can also buy a single item or connect them to create a larger system with more storage for your business or establishment. These items have a classic and calming gray and blue color scheme that fits easily into most environments.